This past weekend we took Gracie to her first doggie park. We searched a few places online & found a place that "said" it was fenced in (wasn't really though...). We'd never let her off the leash before, so we thought it would be fun for her to run around with other dogs. And boy did she take off as soon as we unhooked that leash! And she soon took off, chasing other dogs! Do you live in the Portland area? Do you know of any good dog parks? We're looking for a little better place to take the pup. I am super excited to start following your blog which I found through Liz Denfeld. I recently moved from Portland to Seattle so it seems we are on different paths but I look forward to getting a piece of home with your posts. Awww, what a cutie patootie! This might be a little far out for you guys, but 1000 Acre Dog Park in Troutdale is my very favorite place to take Bodie. 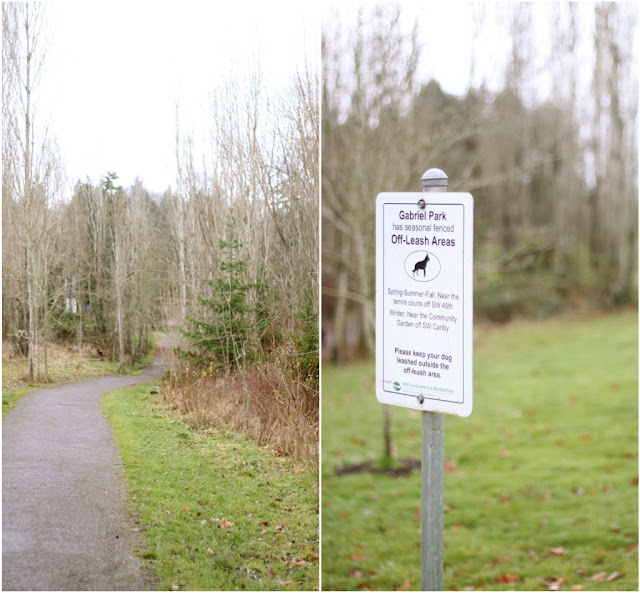 It's not technically fenced, but the dogs can't go far :) Email me if you want some more inside scoop - there's a couple different options of trails once you get there. It's also a great place to get a long walk in. i won't be taking my little one to any dog parks. some of them are so unsanitary, even if they are outside! she is so adorable though. love her little sweater. Normandale Park NE 57th & Halsey. It's completely fenced in and there's a big dog side and a little dog side. It's not big but great for dogs to socialize. Check out PortlandPooch.com too there's a good list of dog parks. aw! you're such a cute little family!